Our area is a paradise for outdoor sports enthusiasts: on the water, the land or in the air. Whether your preference goes out to a bike or horse to discover the hinterland, you’re more into walking or jogging along the beach, or can’t resist taking to the Kieler fjord by boat and sail – our healthy Baltic air is guaranteed to get you moving. Golfclub auf Gut Uhlenhorst, just five kilometres away in Dänischenhagen, is one of the finest golf courses in the province of Schleswig-Holstein. The course, designed by golf architect Donald Harradine, is rife with old fruit trees and offers superb views of the Baltic Sea. The 27-hole course can be played in three tiers. The clubhouse restaurant serves delicious seasonal regional dishes. 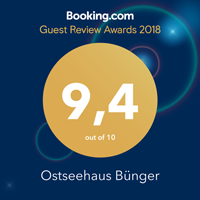 As a guest at Ostseehaus Bünger, you will be given a 10% reduction on the cost of the green fee. The typical holstein end morain landscape, embedded in the place of the Kiel Golfclub Havighorst, offers its visitors a golfing with a special charm. The 18-hole course with many water hazards and bunkers is a real challenge, even for experienced players. On the east side of the Kiel Fjord known for the numerous incoming cruise ships, the Kitzeberg Golf Club invites you to pitching and putting. After a successful game on the 18-hole course, the restaurant “Wildgarten” invites you to a relaxed sit-in to revive the game with a drink. The Colf-club at Schlei promises a golfing experience in the midst of a unique natural landscape. A unique view guarantees a game in front of a fantastic backdrop. The hilly coastal landscape provides for an exciting 18-hole golf course. One of the most beautiful golf courses in Schleswig-Holstein is the Golf-Club Altenhof in Eckernförde. Hilly fields, pasture and woodland guarantee an exciting and varied golfing at 18 holes. Driving range, pitching and putting greens offer beginners as well as old hares perfect conditions to indulge your passion. There are well-founded reasons why, just outside our front door, the waters have been home to the largest sailing event in the world, the Kieler Woche, for the last 100 years: the Kieler fjord is one of the best sailing regions in the world. Whether you want a leisurely day protected from the wind in the fjord itself, or you’re after the excitement past the Bülk lighthouse and Stoller Grund towards the ‘Danish South Sea’, you’re in for a world-class sailing experience. After the excitement of the day, you can moor in the picturesque village of Strande. The Kiel outer fjord at Strande is one of the best surfing and sailing areas in the World and offers perfect conditions for surfers. Experts know where to find the perfect wave around the Bülk lighthouse. For those still practicing and don’t yet have the expertise to head out alone, the Katamaran & Surfschule Westwind Surfing School Westwind or the Wassersport Schwedeneck offer courses for all levels. With the numerous riding paths in the Dänischen Wohld and our near-endless beaches, our area is perfect for horse riding. In Strande, at Gut Alt-Bülk for example, they offer guided rides around the area. Bikes are the ideal way to exploring our gorgeous surroundings as they allow you to discover even the remotest corners. Try the Baltic Cycling Route with its sea views along the coast. But beware, you may be tempted to take a rest to enjoy the fascinating views from the cliffs or the stunning beaches. A detour into the hinterlands is an especially impressive experience. Discover gorgeous farms, ancient village churches and the prehistoric graves so representative of our area’s eventful history.